Indeed, when the A8 goes on sale this fall, it will be the first production car that has machine-taught neural network capabilities used to recognize and react to stop signs and lights in ways that mimic how human brains function. While Tesla's Model S, X, and 3 will allow you to race down the highway at up to 90 mph in Autopilot mode, their Level 2 driving mode, among other things, is not yet able to self-pilot at stop signs and lights. But first, a few caveats about the car. In many respects, the A8's self drive is really advanced cruise control. The driver can only let the car self drive during limited highway conditions without the ability to switch lanes. The self-drive mode only works at a very slow maximum speeds of 37 mph. Also, the car is only equipped to offer Level 3 driving once activated pending legislation that allows for it. 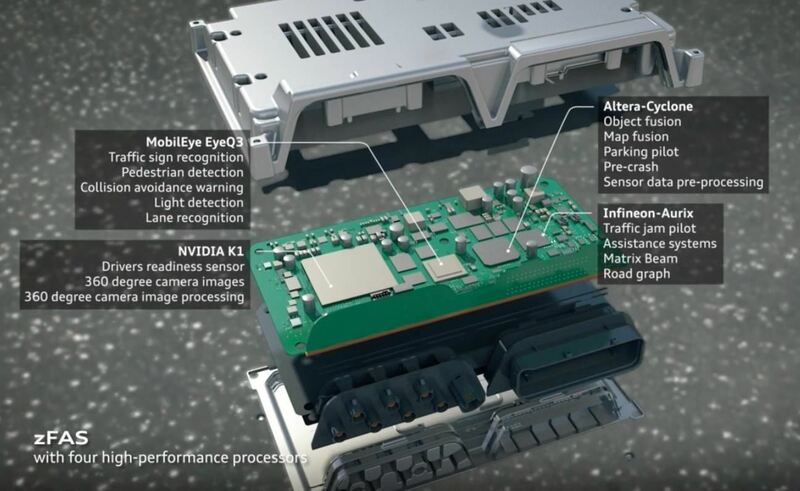 Audi's machine-taught capabilities largely rely on Mobileye-designed cameras, chips, and software; and an Nvidia graphics processor unit (GPU). 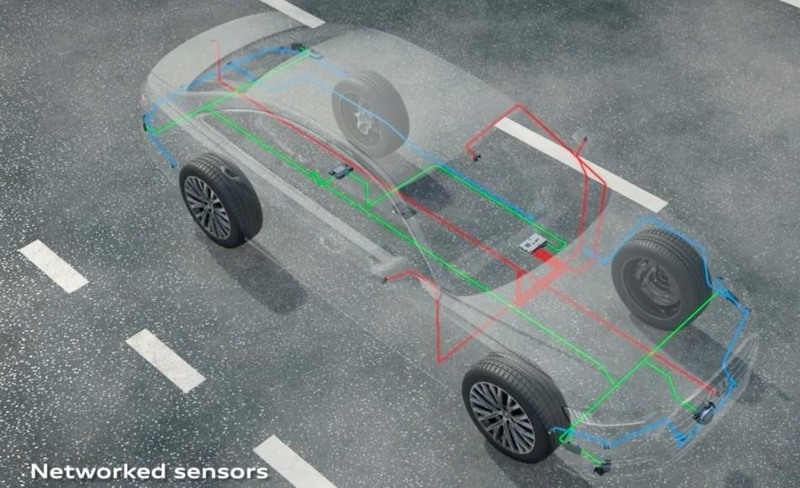 Specific to the stoplight recognition technology, the Audi A8 relies on a Mobileye camera embedded in the front the car. It serves, in many ways, as the "eyes" of the car, always scanning what is in front of the vehicle as the image below shows. The camera alerts the central computer to stop the car at a red light it meets along a highway and to begin moving again when the light turns green. While the Audi A8's maximum autopilot speed of 37 miles per hour is useful for stop-and-go freeway driving, this stoplight feature can come in handy in other driving conditions — specifically, in two-lane urban highways. and traffic jam-pilot assistance (Infineon, a leading chipmaker). However, the stoplight recognition is the main stand out feature in the car and a harbinger of more interesting machine-taught systems for cars yet to come, Anirudh Venkitaraman, an analyst for Frost & Sullivan, told Driverless. More-advanced artificial intelligence (AI) systems than what Audi offers only exist in the prototype stage. But in a production car, [neither] Tesla nor any other OEM offers the Audi A8's level of AI. Audi's technology is also just the start for more exciting things to come from it and other automakers. Again, the Audi A8's much-touted Level 3 capabilities are arguably disappointing given the A8's relatively slow self-drive speeds and limited functionality, but this is just the start. OEMs are experimenting with different designs and are struggling with creating safe-and-reliable Level 3 and Level 4 systems, industry sources say. Which OEM will prevail first is anybody's guess at this point.